If we could resurrect an extinct species, should we? Sciblogs is running a series of posts on de-extinction to coincide with a special feature issue of the journal Functional Ecology focusing on the issue. In this guest post, special issue editor Prof Phil Seddon from the University of Otago delves into the realities of bringing a species back from extinction. Conservationists tend to be conservative – who would have guessed? But the foundations of conservation biology were built around the idea of gathering new tools and approaches across diverse disciplines to address the decline and loss of biodiversity. The conservation movement is also founded on the bedrock truism that “extinction is forever”. But what if extinction no longer is forever? This was the implicit hope behind the emergence of the so-called science of de-extinction – the application of new genetic tools to resurrect lost species… the end of extinction. So why was the conservation community so stingy in their enthusiasm for de-extinction, or even outright hostile to the idea? The devil is in the details, and if something sounds too good to be true… well, you know. A defensible rationale for de-extinction – acknowledging here that no current pathways gets us back exactly what we lost, and that it is more appropriate to talk about the creation of proxies of extinct species – is the restoration of ecological functions lost through extinction. A robust case could be made for increasing the stability and the resilience of ecosystems by restoring lost elements, particularly those species that have disproportionately important roles as keystones or ecosystem engineers. This requires the release of a genetically diverse and healthy group of founders in an attempt to establish a viable free-ranging population in a suitable area of habitat. Sounds easy – one step in a process: first make your mammoth, then, release your mammoth. After all, we reintroduce animals all the time in attempts to restore populations in areas from which they have been lost. Trouble is, even for species that have only recently disappeared from parts of their range, reintroduction success is not guaranteed, In fact, historically, reintroduction success rates have been disappointingly low due to the considerable challenges involved. These include the inability of founder animals to make the transition from captivity to the wild, environmental change since the original extirpation that means habitat no longer exists, development of new threats, or even having the released animals themselves pose new threats to existing species that have their own conservation needs. And all this for species that have been gone for maybe only one or two decade or less. If something has been missing for hundreds, thousands, or even tens of thousands or years, all these risks are multiplied. Environments aren’t static ad evolutionary processes don’t take a time out. The ecosystem will have moved on in the absence of an extinct species, gaps will close and there might simple no longer be any habitat left. There is a real risk that de-extinction might result in re-extinction, or worse, that de-extinction efforts might pose new threats to existing species. 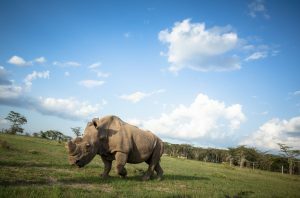 ‘Sudan’, the world’s last remaining male northern white rhino. De-extinction technology might be better applied to saving species on the brink of extinction. Flickr / Make it Kenya. The risk and uncertainties of reintroducing resurrected forms will be hugely reduced if de-extinction candidates are drawn from the most recent extinctions, where we might have more confidence that we understand and can manage the original threats, that habitat still exists, that we know enough about critical features of physiology, biology and behaviour, and we might be more likely to have the appropriate genetic samples, suitable surrogates and applicable husbandry manuals. If the goal of de-extinction is the restoration of lost ecosystem functions, there are two high hurdles to be cleared for any prospective project – two questions must be addressed: will the resurrected form restore the desired functionality, and might the lost function be able to be restored at less risk and less costs using some existing species as an ecological replacement? Where does this leave de-extinction? Still firmly on the table certainly, as a fantastic means to “reframe the possible” and as a suite of tools that could be applied, carefully and appropriately alongside traditional conservation management, to address biodiversity declines. One exciting area being developed is the use of de-extinction technology to rescue species from the brink of extinction – not waiting until the last member of a species has toppled from its perch or slumped against the wall of its enclosure. The greatest achievement of de-extinction might turn out to be the prevention of extinction in the first place. Phil Seddon is a Professor of Zoology at the University of Otago and guest editor of Functional Ecology’s special feature on de-extinction. You can read his full editorial here.